The Chronicle Herald of Halifax, Nova Scotia, Canada, recently ran an article about Mormon missionaries serving in that area. There have been a plethora of such articles in the past few weeks that have crossed my desk. 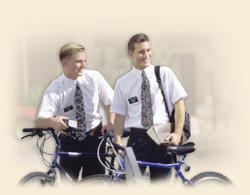 From Canada to Australia, from Florida to the San Francisco Bay area and places in between, newspapers have been telling their readers about the Mormon missionaries walking the streets of their towns. All of the articles have been very similar in content. They talk about the missionaries’ long hours, their financial sacrifices, their limited contact with family back home (Christmas and Mother’s Day phone calls and once-a-week letters), and how apart from the fact that they are serving a mission these boys are just like any other young men — they like girls and fast cars. In addition to the human interest feel-good elements reported in these articles, there are two additional themes that run through them all: rejection and misperception. With but one exception, all of the dozen or so articles I’ve read make a point of mentioning “slammed doors,” “rebuffs,” “rejection,” “abuse,” and “nasty people” who “yell” and “oppose” the LDS missionaries. Also with few exceptions these reports all tell readers that Mormonism is terribly misunderstood. The “myths” highlighted in the articles range from people thinking Mormons churn their own butter to thinking Mormons aren’t Christians; but by far the most common reported misperception encountered by the missionaries has to do with polygamy. Many people are fascinated by the early history of the polygamous Mormons, and so the elders explain. In the early days of the Mormon experience, persecution was rampant. Mormon families moved from region to region, heading West in their wagon trains and running into trouble in many places.With Mormon men dropping like flies at the hands of lynch mobs, many widows were left with young children. They often banded together with other families for protection, becoming, in essence, families with one husband and multiple wives. Only about two per cent of church members were polygamous back then, the elders say. Those who wanted to keep the polygamy tradition left the church, breaking off into splinter sects. A few such groups remain to this day. “They give (our) church a bad name,” says Elder Bevan. We might be tempted to think Elder Bevan’s claims are his alone; however, when I toured Brigham Young’s Lion House in Salt Lake City earlier this summer the sister missionary leading my tour said the same thing. Tours at official LDS sites are scripted; therefore, it seems reasonable to conclude that these historical claims are officially promoted by the LDS Church. The question is, are the claims accurate? Finally, the claim that Mormon men were “dropping like flies at the hands of lynch mobs” or other enemies is just plain untrue. It is true that 17 Mormon men and boys were killed at Haun’s Mill in Missouri in 1838, many years before polygamy became a known doctrine in the LDS Church. But beyond this there is no historical data to support or even suggest widespread murder of Mormon men. Though I searched for several hours, I was unable to find any specific documentation regarding the number of Mormon deaths due to persecution in the early Church. Given the emphasis the LDS Church places on its pioneer history and persecution, it is implausible to think that an actual murderous decimation of the early Church’s male population would go unreported. I would like to comment on a few things about this statment here. there are two additional themes that run through them all: rejection and misperception. With but one exception, all of the dozen or so articles I’ve read make a point of mentioning “slammed doors,” “rebuffs,” “rejection,” “abuse,” and “nasty people” who “yell” and “oppose” the LDS missionaries. Also with few exceptions these reports all tell readers that Mormonism is terribly misunderstood. I know from meeting people in my church and in genearl all over, Many so-called Christians, do sadly slam the door in the faces of Mormons, I have had many talks with people who feel Mormons are a waste of time, How very sad. On my blog, I did an article about mormons using Decption, I feel this really does take place and it gives into the Idea MM’s face (misperception). They beat the drum of “we’ve been persecuted and misunderstood”, AND foster among themselves a deceitful rhetoric which avoids clear disclosure of fundamental Mormon beliefs. Hrmmm…. Oh how we all miss the blunt words of Brigham Young and Bruce McConkie. That blog entry was excellent! But I have a question… How is it that the articles referenced in the blog are getting published in all these papers? Who is doing the writing and publishing of such pro-Mormon material? I also pose the question by Anon -Just who is publishing these pro-Mormon articles? hmm… And I wonder if the articles “clear up” all the “misconceptions” about Mormonism – Do they clearly disclose hidden Mormon belief or is is more ambiguous Mormon rhetoric? I wonder why so many people spend so much time trying to disprove the truthfulness of the Church of Jesus Christ of Latter Day Saints. ( by the way that is the correct name for the church , not “the mormon church”) I have never seen LDS member bashing other religons like so many “christians” do to the members of the LDS faith. As for Polygamy, give it a rest!!!! it was and it is no more. Why don’t you so called christians, try to disprove the truthfulness of the bible, many of the people of that time had more than one wife too. live and let live I say and let God, our Father in Heaven, sort it out!! Brother Holmes, would you deny that polygamy is allowed in the afterlife? I have been told by devout LDS friends that it is, though disallowed here on Earth. As for the bashing you refer to, it stems largely from the LDS attitude that they are the “one true church”. Unless I’m mistaken that is a passive aggressive attack on all other religions. I’d be very careful before signing your life away to them. If you try to leave, Joseph Smith, their founder, husband to over 20 women, says that ‘special’ angels will be charged to you…to make sure that you’re life will be horrible. But when you die, you won’t go to heck cos they don’t believe in it. Everyone goes to heaven and ‘Perfect’ mormons will become Gods! Also, Smith preached that the moon was inhabited by people who dressed up like quakers. I swear this is true. It was raised as a mormon in Ontario Canada. It was actually lots of fun to be a mormon as a kid. I used to hear the craziest stuff on a daily basis. Lots of fun.